I have tried playing some movies with srt subtitles last night and the GOM Player has a little problem with some Unicode SRT subtitle e.g Persian/Farsi SRT file. 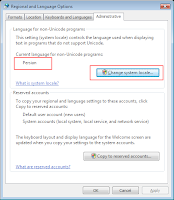 1- Change your current default setting for non-unicode application. It's comes from Regional and Language Option. 2- Download and use of the Mirror SRT Application. The code was developed last night just for solved my own problem. It's not a luxury software. Mirror SRT requires the .NET Framework 3.5 (or above).